Many Windows users prefer to clean install their operating system rather than upgrade an existing one. Why? You never know what remnants might have been left behind, and if you run into a quirky issue, you'll always wonder, "Is this the result of an upgrade gone bad?" Thankfully, that's not something you'll have to worry about with the free Windows 10 upgrade. As you know, Windows 7 and Windows 8.1 users will be able to upgrade to Windows 10 for free during the first year of the OS's release. What wasn't known is if Microsoft would allow for a clean install when upgrading. Microsoft's Gabriel Aul answered that question on Twitter today. "Once you upgrade Windows 10 with the free upgrade offer you will be able to clean reinstall Windows 10 on same device any time," Aul said. Back in what's now considered the old days of computing, a clean upgrade was accomplished by starting the install with a new Windows disc, and then inserting the old Windows disc when prompted so that Microsoft could confirm everything was legit. Things changed with the free update from Windows 8 to Windows 8.1. Instead of messing around with optical media, Windows 8 users upgraded through the Windows Store, which installed over the top of Windows 8 and moved the old OS to a folder (Windows.old). More recently, Microsoft began offering downloads of Windows 8.1 images without having to input a Windows 8.1 license via the Windows Installation Media Creation Tool. This will likely be the case with Windows 10 as well. 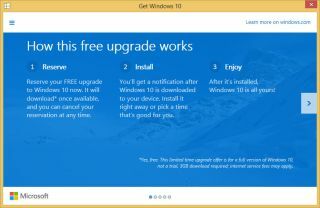 While the full details haven't yet been confirmed, my hunch is that when you receive a new Windows 10 key from upgrading your existing Windows 7 or 8.1 install, you'll be able to use that to activate a fresh Windows 10 installation.